So... has anyone noticed that the flag of Láadan is the Drupal logo? I can't find any reason to link Láadan and Drupal other than that what might be the "official" website for Láadan is powered by Drupal. I think we should replace it with a more generic flag. I noticed that too. It uses the Drupal logo because the official website about the language is run on Drupal and they did not change the default Drupal logo. I don't think there is a Láadan flag (yet). Is there a "language icon" that you think it would represent better this language? 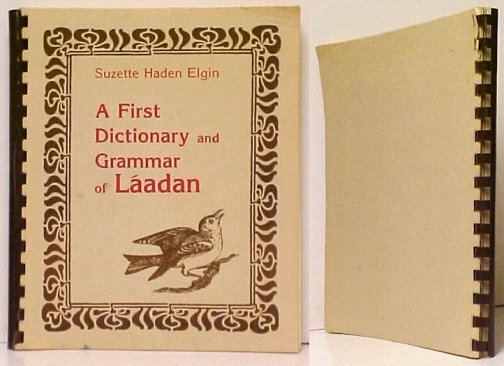 Well, the original creator of Láadan, the linguist and writer Suzette Haden Elgin, unfortunately passed away last year. I've drawn up a provisional idea for a Láadan flag, two versions of which you can see at my Dropbox account. I've also sent a note to the Láadan Working Group with those links, and I hope they respond either approvingly, with their preferred colours, or with a design of their own. It's a little small, but it still looks recognizable. Even if most people don't recognize it as a bird, it's still a unique image and those who know the language will likely realize the reason for it. Another idea — I took the basic bird motif Raizin provided and redrew it in Adobe Illustrator with fairly bold, slightly simplified lines so that the bird is more recognizable at smaller sizes. And here it is at the 30x20 size it would actually be used at. I think it is at least recognizable as a bird. That IS more recognizable as a bird, but much less regocnizable as the bird on the Láadan book. The shape and colors are different, and the branch is missing. Keeping the same silhouette and similar colors is crucial, if we want Láadan speakers and enthusiasts to recognize it as the bird from the book cover. I opened an issue on GitHub - https://github.com/Tatoeba/tatoeba2/issues/1303 - and I've started working on it.